Peat bogs are freshwater wetlands that develop in areas with standing water and low soil fertility. Marshes develop along the edges of rivers and lakes. A wetland is a distinct ecosystem that is inundated by water, either permanently or seasonally, where oxygen-free processes prevail. The primary factor that distinguishes wetlands from other land forms or water bodies is the characteristic vegetation of aquatic plants, adapted to the unique hydric soil. Wetlands play a number of functions, including water purification, water storage, processing of carbon and other nutrients, stabilization of shorelines, and support of plants and animals. Wetlands are also considered the most biologically diverse of all ecosystems, serving as home to a wide range of plant and animal life. Whether any individual wetland performs these functions, and the degree to which it performs them, depends on characteristics of that wetland and the lands and waters near it. Methods for rapidly assessing these functions, wetland ecological health, and general wetland condition have been developed in many regions and have contributed to wetland conservation partly by raising public awareness of the functions and the ecosystem services some wetlands provide. Wetlands occur naturally on every continent. The main wetland types are swamp, marsh, bog, and fen; sub-types include mangrove forest, carr, pocosin, floodplains, mire, vernal pool, sink, and many others. Many peatlands are wetlands. The water in wetlands is either freshwater, brackish, or saltwater. Wetlands can be tidal (inundated by tides) or non-tidal. The largest wetlands include the Amazon River basin, the West Siberian Plain, the Pantanal in South America, and the Sundarbans in the Ganges-Brahmaputra delta. The UN Millennium Ecosystem Assessment determined that environmental degradation is more prominent within wetland systems than any other ecosystem on Earth. Constructed wetlands are used to treat municipal and industrial wastewater as well as stormwater runoff. They may also play a role in water-sensitive urban design. A patch of land that develops pools of water after a rain storm would not necessarily be considered a "wetland", even though the land is wet. Wetlands have unique characteristics: they are generally distinguished from other water bodies or landforms based on their water level and on the types of plants that live within them. Specifically, wetlands are characterized as having a water table that stands at or near the land surface for a long enough period each year to support aquatic plants. A more concise definition is a community composed of hydric soil and hydrophytes. Wetlands have also been described as ecotones, providing a transition between dry land and water bodies. Mitsch and Gosselink write that wetlands exist "...at the interface between truly terrestrial ecosystems and aquatic systems, making them inherently different from each other, yet highly dependent on both." In environmental decision-making, there are subsets of definitions that are agreed upon to make regulatory and policy decisions. A wetland is "an ecosystem that arises when inundation by water produces soils dominated by anaerobic and aerobic processes, which, in turn, forces the biota, particularly rooted plants, to adapt to flooding." There are four main kinds of wetlands – marsh, swamp, bog and fen (bogs and fens being types of mires). Some experts also recognize wet meadows and aquatic ecosystems as additional wetland types. The largest wetlands in the world include the swamp forests of the Amazon and the peatlands of Siberia. Article 1.1: "...wetlands are areas of marsh, fen, peatland or water, whether natural or artificial, permanent or temporary, with water that is static or flowing, fresh, brackish or salt, including areas of marine water the depth of which at low tide does not exceed six metres." Article 2.1: "[Wetlands] may incorporate riparian and coastal zones adjacent to the wetlands, and islands or bodies of marine water deeper than six metres at low tide lying within the wetlands." Although the general definition given above applies around the world, each county and region tends to have its own definition for legal purposes. In the United States, wetlands are defined as "those areas that are inundated or saturated by surface or groundwater at a frequency and duration sufficient to support, and that under normal circumstances do support, a prevalence of vegetation typically adapted for life in saturated soil conditions. Wetlands generally include swamps, marshes, bogs and similar areas". This definition has been used in the enforcement of the Clean Water Act. Some US states, such as Massachusetts and New York, have separate definitions that may differ from the federal government's. In the United States Code, the term wetland is defined "as land that (A) has a predominance of hydric soils, (B) is inundated or saturated by surface or groundwater at a frequency and duration sufficient to support a prevalence of hydrophytic vegetation typically adapted for life in saturated soil conditions and (C) under normal circumstances supports a prevalence of such vegetation." Related to this legal definitions, the term "normal circumstances" are conditions expected to occur during the wet portion of the growing season under normal climatic conditions (not unusually dry or unusually wet), and in the absence of significant disturbance. It is not uncommon for a wetland to be dry for long portions of the growing season. Wetlands can be dry during the dry season and abnormally dry periods during the wet season, but under normal environmental conditions the soils in a wetland will be saturated to the surface or inundated such that the soils become anaerobic, and those conditions will persist through the wet portion of the growing season. The most important factor producing wetlands is flooding. The duration of flooding or prolonged soil saturation by groundwater determines whether the resulting wetland has aquatic, marsh or swamp vegetation. Other important factors include fertility, natural disturbance, competition, herbivory, burial and salinity. When peat accumulates, bogs and fens arise. Wetlands vary widely due to local and regional differences in topography, hydrology, vegetation, and other factors, including human involvement. Wetland hydrology is associated with the spatial and temporal dispersion, flow, and physio-chemical attributes of surface and ground water in its reservoirs. Based on hydrology, wetlands can be categorized as riverine (associated with streams), lacustrine (associated with lakes and reservoirs), and palustrine (isolated). Sources of hydrological flows into wetlands are predominantly precipitation, surface water, and groundwater. Water flows out of wetlands by evapotranspiration, surface runoff, and subsurface water outflow. Hydrodynamics (the movement of water through and from a wetland) affects hydro-periods (temporal fluctuations in water levels) by controlling the water balance and water storage within a wetland. Landscape characteristics control wetland hydrology and hydrochemistry. The O2 and CO2 concentrations of water depend on temperature and atmospheric pressure. Hydrochemistry within wetlands is determined by the pH, salinity, nutrients, conductivity, soil composition, hardness, and the sources of water. Water chemistry of wetlands varies across landscapes and climatic regions. Wetlands are generally minerotrophic with the exception of bogs. Bogs receive most of their water from the atmosphere; therefore, their water usually has low mineral ionic composition. In contrast, groundwater has a higher concentration of dissolved nutrients and minerals. The water chemistry of fens ranges from low pH and low minerals to alkaline with high accumulation of calcium and magnesium because they acquire their water from precipitation as well as ground water. Salinity has a strong influence on wetland water chemistry, particularly in wetlands along the coast. and in regions with large precipitation deficits. In non-riverine wetlands, natural salinity is regulated by interactions between ground and surface water, which may be influenced by human activity. Carbon is the major nutrient cycled within wetlands. Most nutrients, such as sulfur, phosphorus, carbon, and nitrogen are found within the soil of wetlands. Anaerobic and aerobic respiration in the soil influences the nutrient cycling of carbon, hydrogen, oxygen, and nitrogen, and the solubility of phosphorus thus contributing to the chemical variations in its water. Wetlands with low pH and saline conductivity may reflect the presence of acid sulfates and wetlands with average salinity levels can be heavily influenced by calcium or magnesium. Biogeochemical processes in wetlands are determined by soils with low redox potential. Wetland soils are identified by redoxymorphic mottles or low chroma, as determined by the Munsell Color System. The biota of a wetland system includes its flora and fauna as described below. The most important factor affecting the biota is the duration of flooding. Other important factors include fertility and salinity. In fens, species are highly dependent on water chemistry. The chemistry of water flowing into wetlands depends on the source of water and the geological material in which it flows through as well as the nutrients discharged from organic matter in the soils and plants at higher elevations in slope wetlands. Biota may vary within a wetland due to season or recent flood regimes. 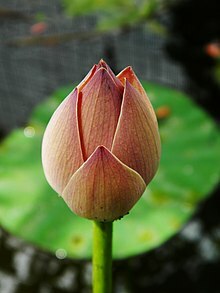 Bud of Nelumbo nucifera, an aquatic plant. There are four main groups of hydrophytes that are found in wetland systems throughout the world. Submerged wetland vegetation can grow in saline and fresh-water conditions. Some species have underwater flowers, while others have long stems to allow the flowers to reach the surface. Submerged species provide a food source for native fauna, habitat for invertebrates, and also possess filtration capabilities. Examples include seagrasses and eelgrass. Floating water plants or floating vegetation is usually small, like arrow arum (Peltandra virginica). Trees and shrubs, where they comprise much of the cover in saturated soils, qualify those areas in most cases as swamps. The upland boundary of swamps is determined partly by water levels. This can be affected by dams Some swamps can be dominated by a single species, such as silver maple swamps around the Great Lakes. Others, like those of the Amazon basin, have large numbers of different tree species. Examples include cypress (Taxodium) and mangrove. Many species of frogs live in wetlands, while others visit them each year to lay eggs. Snapping turtles are one of the many kinds of turtles found in wetlands. Fish are more dependent on wetland ecosystems than any other type of habitat. Seventy-five percent of the United States' commercial fish and shellfish stocks depend solely on estuaries to survive. Tropical fish species need mangroves for critical hatchery and nursery grounds and the coral reef system for food. Amphibians such as frogs need both terrestrial and aquatic habitats in which to reproduce and feed. While tadpoles control algal populations, adult frogs forage on insects. Frogs are used as an indicator of ecosystem health due to their thin skin which absorbs both nutrient and toxins from the surrounding environment resulting in an above average extinction rate in unfavorable and polluted environmental conditions. Reptiles such as alligators and crocodiles are common in wetlands of some regions. Alligators occur in fresh water along with the fresh water species of the crocodile.The Florida Everglades is the only place in the world where both crocodiles and alligators coexist. The saltwater crocodile inhabits estuaries and mangroves and can be seen in the coastline bordering the Great Barrier Reef in Australia.Snakes, lizards and turtles also can be seen throughout wetlands. Snapping turtles are one of the many kinds of turtles found in wetlands. Mammals include numerous small and medium-sized species such as voles, bats, and platypus in addition to large herbivorous and apex species such as the beaver, coypu, swamp rabbit, Florida panther, and moose. Wetlands attract many mammals due to abundant seeds, berries, and other vegetation components, as well as abundant populations of prey such as invertebrates, small reptiles and amphibians. Plankton are algae which are microscopic, free-floating algae. This algae is so tiny that on average, if 50 of these microscopic algae were lined up end-to-end, it would only measure one millimetre. Plankton are the basis of the food web and are responsible for primary production in the ocean using photosynthesis to make food. Filamentous algae are long strands of algae cells that form floating mats. Chara and Nitella algae are upright algae that look like a submerged plant with roots. Wetlands are located in every climatic zone. Temperatures vary greatly depending on the location of the wetland. Many of the world's wetlands are in temperate zones, midway between the North or South Pole and the equator. In these zones, summers are warm and winters are cold, but temperatures are not extreme. In a subtropical zone wetland, such as one along the Gulf of Mexico, a typical temperature might be 11 °C (52 °F). Wetlands in the tropics are much warmer for a larger portion of the year. Wetlands on the Arabian Peninsula can reach temperatures exceeding 50 °C (122 °F) and would therefore be subject to rapid evaporation. In northeastern Siberia, which has a polar climate, wetland temperatures can be as low as −50 °C (−58 °F). Peatlands insulate the permafrost in subarctic regions, thus delaying or preventing thawing of permafrost during summer, as well as inducing the formation of permafrost. The amount of precipitation a wetland receives varies widely according to its area. Wetlands in Wales, Scotland, and western Ireland typically receive about 1,500 mm (59 in) per year. In some places in Southeast Asia, where heavy rains occur, they can receive up to 10,000 mm (390 in). In some drier regions, wetlands exist where as little as 180 mm (7.1 in) precipitation occurs each year. The economic worth of the ecosystem services provided to society by intact, naturally functioning wetlands is frequently much greater than the perceived benefits of converting them to 'more valuable' intensive land use – particularly as the profits from unsustainable use often go to relatively few individuals or corporations, rather than being shared by society as a whole. Unless otherwise cited, ecosystem services information is based on the following series of references. To replace these wetland ecosystem services, enormous amounts of money would need to be spent on water purification plants, dams, levees, and other hard infrastructure, and many of the services are impossible to replace. Storage reservoirs and flood protection: The wetland system of floodplains is formed from major rivers downstream from their headwaters. "The floodplains of major rivers act as natural storage reservoirs, enabling excess water to spread out over a wide area, which reduces its depth and speed. Wetlands close to the headwaters of streams and rivers can slow down rainwater runoff and spring snowmelt so that it doesn't run straight off the land into water courses. This can help prevent sudden, damaging floods downstream." Notable river systems that produce large spans of floodplain include the Nile River, the Niger river inland delta, [the Zambezi River flood plain], [the Okavango River inland delta], [the Kafue River flood plain][the Lake Bangweulu flood plain] (Africa), Mississippi River (USA), Amazon River (South America), Yangtze River (China), Danube River (Central Europe) and Murray-Darling River (Australia). Human impact: Converting wetlands to upland through drainage and development forces adjoining or downstream water channels into narrower corridors. This accelerates watershed hydrologic response to storm events and this increases the need in some cases for alternative means of flood control. That is because the newly formed channels must manage the same amount of precipitation, causing flood peaks to be [higher or deeper] and floodwaters to travel faster. Water management engineering developments in the past century have degraded these wetlands through the construction of artificial embankments. These constructions may be classified as dykes, bunds, levees, weirs, barrages and dams but serve the single purpose of concentrating water into a select source or area. Wetland water sources that were once spread slowly over a large, shallow area are pooled into deep, concentrated locations. Loss of wetland floodplains results in more severe and damaging flooding. Catastrophic human impact in the Mississippi River floodplains was seen in death of several hundred individuals during a levee breach in New Orleans caused by Hurricane Katrina. Ecological catastrophic events from human-made embankments have been noticed along the Yangtze River floodplains since the middle of the river has become prone to more frequent and damaging flooding. Some of these events include the loss of riparian vegetation, a 30% loss of the vegetation cover throughout the river's basin, a doubling of the percentage of the land affected by soil erosion, and a reduction in reservoir capacity through siltation build-up in floodplain lakes. The surface water which is the water visibly seen in wetland systems only represents a portion of the overall water cycle which also includes atmospheric water and groundwater. Wetland systems are directly linked to groundwater and a crucial regulator of both the quantity and quality of water found below the ground. Wetland systems that are made of permeable sediments like limestone or occur in areas with highly variable and fluctuating water tables especially have a role in groundwater replenishment or water recharge. Sediments that are porous allow water to filter down through the soil and overlying rock into aquifers which are the source of 95% of the world's drinking water. Wetlands can also act as recharge areas when the surrounding water table is low and as a discharge zone when it is too high. Karst (cave) systems are a unique example of this system and are a connection of underground rivers influenced by rain and other forms of precipitation. These wetland systems are capable of regulating changes in the water table on upwards of 130 m (430 ft). Human impact: Groundwater is an important source of water for drinking and irrigation of crops. Over 1 billion people in Asia and 65% of the public water sources in Europe source 100% of their water from groundwater. Irrigation is a massive use of groundwater with 80% of the world's groundwater used for agricultural production. Unsustainable abstraction of groundwater has become a major concern. In the Commonwealth of Australia, water licensing is being implemented to control use of water in major agricultural regions. On a global scale, groundwater deficits and water scarcity is one of the most pressing concerns facing the 21st century. Tidal and inter-tidal wetland systems protect and stabilize coastal zones. Coral reefs provide a protective barrier to coastal shoreline. Mangroves stabilize the coastal zone from the interior and will migrate with the shoreline to remain adjacent to the boundary of the water. The main conservation benefit these systems have against storms and storm surges is the ability to reduce the speed and height of waves and floodwaters. Human impact: The sheer number of people who live and work near the coast is expected to grow immensely over the next fifty years. From an estimated 200 million people that currently live in low-lying coastal regions, the development of urban coastal centers is projected to increase the population by fivefold within 50 years. The United Kingdom has begun the concept of managed coastal realignment. This management technique provides shoreline protection through restoration of natural wetlands rather than through applied engineering. In East Asia, reclamation of coastal wetlands has resulted in widespread transformation of the coastal zone, and up to 65% of coastal wetlands have been destroyed by coastal development. One analysis using the impact of hurricanes versus storm protection provided naturally by wetlands projected the value of this service at US$33,000/hectare/year. Nutrient retention: Wetlands cycle both sediments and nutrients balancing terrestrial and aquatic ecosystems. A natural function of wetland vegetation is the up-take, storage, and (for nitrate) the removal of nutrients found in runoff from the surrounding soil and water. In many wetlands, nutrients are retained until plants die or are harvested by animals or humans and taken to another location, or until microbial processes convert soluble nutrients to a gas as is the case with nitrate. Sediment and heavy metal traps: Precipitation and surface runoff induces soil erosion, transporting sediment in suspension into and through waterways. These sediments move towards larger and more sizable waterways through a natural process that moves water towards oceans. All types of sediments which may be composed of clay, sand, silt, and rock can be carried into wetland systems through this process. Wetland vegetation acts as a physical barrier to slow water flow and trap sediment for short or long periods of time. Suspended sediment often contains heavy metals that are retained when wetlands trap the sediment. In some cases, certain metals are taken up through wetland plant stems, roots, and leaves. Many floating plant species, for example, can absorb and filter heavy metals. Water hyacinth (Eichhornia crassipes), duckweed (Lemna) and water fern (Azolla) store iron and copper commonly found in wastewater. Many fast-growing plants rooted in the soils of wetlands such as cattail (Typha) and reed (Phragmites) also aid in the role of heavy metal up-take. Animals such as the oyster can filter more than 200 litres (53 US gal) of water per day while grazing for food, removing nutrients, suspended sediments, and chemical contaminants in the process. On the other hand, some types of wetlands facilitate the mobilization and bioavailability of mercury (another heavy metal), which in its methyl mercury form increases the risk of bioaccumulation in fish important to animal food webs and harvested for human consumption. Capacity: The ability of wetland systems to store or remove nutrients and trap sediment and associated metals is highly efficient and effective but each system has a threshold. An overabundance of nutrient input from fertilizer run-off, sewage effluent, or non-point pollution will cause eutrophication. Upstream erosion from deforestation can overwhelm wetlands making them shrink in size and cause dramatic biodiversity loss through excessive sedimentation load. Retaining high levels of metals in sediments is problematic if the sediments become resuspended or oxygen and pH levels change at a future time. The capacity of wetland vegetation to store heavy metals depends on the particular metal, oxygen and pH status of wetland sediments and overlying water, water flow rate (detention time), wetland size, season, climate, type of plant, and other factors. Human impact: The capacity of a wetland to store sediment, nutrients, and metals can be diminished if sediments are compacted such as by vehicles or heavy equipment, or are regularly tilled. Unnatural changes in water levels and water sources also can affect the water purification function. If water purification functions are impaired, excessive loads of nutrients enter waterways and cause eutrophication. This is of particular concern in temperate coastal systems. The main sources of coastal eutrophication are industrially made nitrogen, which is used as fertilizer in agricultural practices, as well as septic waste runoff. Nitrogen is the limiting nutrient for photosynthetic processes in saline systems, however in excess, it can lead to an overproduction of organic matter that then leads to hypoxic and anoxic zones within the water column. Without oxygen, other organisms cannot survive, including economically important finfish and shellfish species. Examples: An example of how a natural wetland is used to provide some degree of sewage treatment is the East Kolkata Wetlands in Kolkata, India. The wetlands cover 125 square kilometres (48 sq mi), and are used to treat Kolkata's sewage. The nutrients contained in the wastewater sustain fish farms and agriculture. The function of most natural wetland systems is not to manage wastewater. However, their high potential for the filtering and the treatment of pollutants has been recognized by environmental engineers that specialize in the area of wastewater treatment. These constructed wetland systems are highly controlled environments that intend to mimic the occurrences of soil, flora, and microorganisms in natural wetlands to aid in treating wastewater effluent. Constructed wetlands can be used to treat raw sewage, storm water, agricultural and industrial effluent. They are constructed with flow regimes, micro-biotic composition, and suitable plants in order to produce the most efficient treatment process. Other advantages of constructed wetlands are the control of retention times and hydraulic channels. 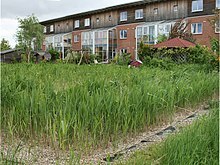 The most important factors of constructed wetlands are the water flow processes combined with plant growth. Constructed wetland systems can be surface flow systems with only free-floating macrophytes, floating-leaved macrophytes, or submerged macrophytes; however, typical free water surface systems are usually constructed with emergent macrophytes. Subsurface flow-constructed wetlands with a vertical or a horizontal flow regime are also common and can be integrated into urban areas as they require relatively little space. Wetland systems' rich biodiversity is becoming a focal point at International Treaty Conventions and within the World Wildlife Fund organization due to the high number of species present in wetlands, the small global geographic area of wetlands, the number of species which are endemic to wetlands, and the high productivity of wetland systems. Hundred of thousands of animal species, 20,000 of them vertebrates, are living in wetland systems. The discovery rate of fresh water fish is at 200 new species per year. The impact of maintaining biodiversity is seen at the local level through job creation, sustainability, and community productivity. A good example is the Lower Mekong basin which runs through Cambodia, Laos, and Vietnam. Supporting over 55 million people, the sustainability of the region is enhanced through wildlife tours. The U.S. state of Florida has estimated that US$1.6 billion was generated in state revenue from recreational activities associated with wildlife. Biodiverse river basins: The Amazon holds 3,000 species of freshwater fish species within the boundaries of its basin, whose function it is to disperse the seeds of trees. One of its key species, the Piramutaba catfish, Brachyplatystoma vaillantii, migrates more than 3,300 km (2,100 mi) from its nursery grounds near the mouth of the Amazon River to its spawning grounds in Andean tributaries, 400 m (1,300 ft) above sea level, distributing plants seed along the route. Productive intertidal zones: Intertidal mudflats have a level of productivity similar to that of some wetlands even while possessing a low number of species. The abundance of invertebrates found within the mud are a food source for migratory waterfowl. Critical life-stage habitat: Mudflats, saltmarshes, mangroves, and seagrass beds have high levels of both species richness and productivity, and are home to important nursery areas for many commercial fish stocks. Genetic diversity: Populations of many species are confined geographically to only one or a few wetland systems, often due to the long period of time that the wetlands have been physically isolated from other aquatic sources. For example, the number of endemic species in Lake Baikal in Russia classifies it as a hotspot for biodiversity and one of the most biodiverse wetlands in the entire world. Evidence from a research study by Mazepova et al. suggest that the number of crustacean species endemic to Baikal Lake (over 690 species and subspecies) exceeds the number of the same groups of animals inhabiting all the fresh water bodies of Eurasia together. Its 150 species of free-living Platyhelminthes alone is analogous to the entire number in all of Eastern Siberia. The 34 species and subspecies number of Baikal sculpins is more than twice the number of the analogous fauna that inhabits Eurasia. One of the most exciting discoveries was made by A. V. Shoshin who registered about 300 species of free-living nematodes using only six near-shore sampling localities in the Southern Baikal. "If we will take into consideration, that about 60% of the animals can be found nowhere else except Baikal, it may be assumed that the lake may be the biodiversity center of the Eurasian continent." Human impact: Biodiversity loss occurs in wetland systems through land use changes, habitat destruction, pollution, exploitation of resources, and invasive species. Vulnerable, threatened, and endangered species number at 17% of waterfowl, 38% of fresh-water dependent mammals, 33% of freshwater fish, 26% of freshwater amphibians, 72% of freshwater turtles, 86% of marine turtles, 43% of crocodilians and 27% of coral reef-building species. Introduced hydrophytes in different wetland systems can have devastating results. The introduction of water hyacinth, a native plant of South America into Lake Victoria in East Africa as well as duckweed into non-native areas of Queensland, Australia, have overtaken entire wetland systems suffocating the wetlands and reducing the diversity of other plants and animals. This is largely due to their phenomenal growth rate and ability to float and grow on the surface of the water. Wetland productivity is linked to the climate, wetland type, and nutrient availability. Low water and occasional drying of the wetland bottom during droughts (dry marsh phase) stimulate plant recruitment from a diverse seed bank and increase productivity by mobilizing nutrients. In contrast, high water during deluges (lake marsh phase) causes turnover in plant populations and creates greater interspersion of element cover and open water, but lowers overall productivity. During a cover cycle that ranges from open water to complete vegetation cover, annual net primary productivity may vary 20-fold. The grasses of fertile floodplains such as the Nile produce the highest yield including plants such as Arundo donax (giant reed), Cyperus papyrus (papyrus), Phragmites (reed) and Typha (cattail, bulrush). Wetlands naturally produce an array of vegetation and other ecological products that can be harvested for personal and commercial use. The most significant of these is fish which have all or part of their life-cycle occur within a wetland system. Fresh and saltwater fish are the main source of protein for one billion people and comprise 15% of an additional two billion people's diets. In addition, fish generate a fishing industry that provides 80% of the income and employment to residents in developing countries. Another food staple found in wetland systems is rice, a popular grain that is consumed at the rate of one fifth of the total global calorie count. In Bangladesh, Cambodia and Vietnam, where rice paddies are predominant on the landscape, rice consumption reach 70%. Some native wetland plants in the Caribbean and Australia are harvested sustainably for medicinal compounds; these include the red mangrove (Rhizophora mangle) which possesses antibacterial, wound-healing, anti-ulcer effects, and antioxidant properties. Food converted to sweeteners and carbohydrates include the sago palm of Asia and Africa (cooking oil), the nipa palm of Asia (sugar, vinegar, alcohol, and fodder) and honey collection from mangroves. More than supplemental dietary intake, this produce sustains entire villages. Coastal Thailand villages earn the key portion of their income from sugar production while the country of Cuba relocates more than 30,000 hives each year to track the seasonal flowering of the mangrove Avicennia. Human impact: Over-fishing is the major problem for sustainable use of wetlands. Concerns are developing over certain aspects of farm fishing, which uses natural waterways to harvest fish for human consumption and pharmaceuticals. This practice has become especially popular in Asia and the South Pacific. Its impact upon much larger waterways downstream has negatively affected many small island developing states. Threats to rice fields mainly stem from inappropriate water management, introduction of invasive alien species, agricultural fertilizers, pesticides, and land use changes. Industrial-scale production of palm oil threatens the biodiversity of wetland ecosystems in parts of southeast Asia, Africa, and other developing countries. Over-exploitation of wetland products can occur at the community level as is sometimes seen throughout coastal villages of Southern Thailand where each resident may obtain for themselves every consumable of the mangrove forest (fuelwood, timber, honey, resins, crab, and shellfish) which then becomes threatened through increasing population and continual harvest. Some types of wetlands can serve as fire breaks that help slow the spread of minor wildfires. Larger wetland systems can influence local precipitation patterns. Some boreal wetland systems in catchment headwaters may help extend the period of flow and maintain water temperature in connected downstream waters. Pollination services are supported by many wetlands which may provide the only suitable habitat for pollinating insects, birds, and mammals in highly developed areas. It is likely that wetlands have other functions whose benefits to society and other ecosystems have yet to be discovered. Wetlands perform two important functions in relation to climate change. They have mitigation effects through their ability to sink carbon, converting a greenhouse gas (carbon dioxide) to solid plant material through the process of photosynthesis, and also through their ability to store and regulate water. Wetlands store approximately 44.6 million tonnes of carbon per year globally. In salt marshes and mangrove swamps in particular, the average carbon sequestration rate is 210 g CO2 m−2 y−1 while peatlands sequester approximately 20–30 g CO2 m−2 y−1. Coastal wetlands, such as tropical mangroves and some temperate salt marshes, are known to be sinks for carbon that otherwise contributes to climate change in its gaseous forms (carbon dioxide and methane). The ability of many tidal wetlands to store carbon and minimize methane flux from tidal sediments has led to sponsorship of blue carbon initiatives that are intended to enhance those processes. However, depending on their characteristics, some wetlands are a significant source of methane emissions and some are also emitters of nitrous oxide which is a greenhouse gas with a global warming potential 300 times that of carbon dioxide and is the dominant ozone-depleting substance emitted in the 21st century. Excess nutrients mainly from anthropogenic sources have been shown to significantly increase the N2O fluxes from wetland soils through denitrification and nitrification processes (see table below). A study in the intertidal region of a New England salt marsh showed that excess levels of nutrients might increase N2O emissions rather than sequester them. Data on nitrous oxide fluxes from wetlands in the southern hemisphere are lacking, as are ecosystem-based studies including the role of dominant organisms that alter sediment biogeochemistry. Aquatic invertebrates produce ecologically-relevant nitrous oxide emissions due to ingestion of denitrifying bacteria that live within the subtidal sediment and water column and thus may also be influencing nitrous oxide production within some wetlands. In Southeast Asia, peatswamp forests and soils are being drained, burnt, mined, and overgrazed, contributing severely to climate change. As a result of peat drainage, the organic carbon that was built up over thousands of years and is normally under water is suddenly exposed to the air. It decomposes and turns into carbon dioxide (CO2), which is released into the atmosphere. Peat fires cause the same process to occur and in addition create enormous clouds of smoke that cross international borders, such as happens every year in Southeast Asia. While peatlands constitute only 3% of the world's land area, their degradation produces 7% of all fossil fuel CO2 emissions. Through the building of dams, Wetlands International is halting the drainage of peatlands in Southeast Asia, hoping to mitigate CO2 emissions. Concurrent wetland restoration techniques include reforestation with native tree species as well as the formation of community fire brigades. This sustainable approach can be seen in central Kalimantan and Sumatra, Indonesia. Stress that maintains ecosystem integrity. Ecosystem integrity is damaged but can recover in time without assistance. Human intervention may be needed in order for ecosystem to recover. Fog rising over the Mukri bog near Mukri, Estonia. The bog has an area of 2,147 hectares (5,310 acres) and has been protected since 1992. In order to maintain wetlands and sustain their functions, alterations and disturbances that are outside the normal range of variation should be minimized. Wetlands are vital ecosystems that provide livelihoods for the millions of people who live in and around them. The Millennium Development Goals (MDGs) called for different sectors to join forces to secure wetland environments in the context of sustainable development and improving human wellbeing. A three-year project carried out by Wetlands International in partnership with the International Water Management Institute found that it is possible to conserve wetlands while improving the livelihoods of people living among them. Case studies conducted in Malawi and Zambia looked at how dambos – wet, grassy valleys or depressions where water seeps to the surface – can be farmed sustainably to improve livelihoods. Mismanaged or overused dambos often become degraded, however, using a knowledge exchange between local farmers and environmental managers, a protocol was developed using soil and water management practices. Project outcomes included a high yield of crops, development of sustainable farming techniques, and adequate water management generating enough water for use as irrigation. Before the project, there were cases where people had died from starvation due to food shortages. By the end of it, many more people had access to enough water to grow vegetables. A key achievement was that villagers had secure food supplies during long, dry months. They also benefited in other ways: nutrition was improved by growing a wider range of crops, and villagers could also invest in health and education by selling produce and saving money. The Convention on Wetlands of International Importance, especially as Waterfowl Habitat, or Ramsar Convention, is an international treaty designed to address global concerns regarding wetland loss and degradation. The primary purposes of the treaty are to list wetlands of international importance and to promote their wise use, with the ultimate goal of preserving the world's wetlands. Methods include restricting access to the majority portion of wetland areas, as well as educating the public to combat the misconception that wetlands are wastelands. The Convention works closely with five International Organisation Partners. These are: Birdlife International, the IUCN, the International Water Management Institute, Wetlands International and the World Wide Fund for Nature. The partners provide technical expertise, help conduct or facilitate field studies and provide financial support. The IOPs also participate regularly as observers in all meetings of the Conference of the Parties and the Standing Committee and as full members of the Scientific and Technical Review Panel. The value of a wetland to local communities, as well as the value of wetland systems generally to the earth and to humankind, is one of the most important valuations that can be conducted for sustainable development. This typically involves first mapping a region's wetlands, then assessing the functions and ecosystem services the wetlands provide individually and cumulatively, and evaluating that information to prioritize or rank individual wetlands or wetland types for conservation, management, restoration, or development. Over a longer period, it requires keeping inventories of known wetlands and monitoring a representative sample of the wetlands to determine changes due to both natural and human factors. Such a valuation process is used to educate decision-makers such as governments of the importance of particular wetlands within their jurisdiction. Rapid assessment methods are used to score, rank, rate, or categorize various functions, ecosystem services, species, communities, levels of disturbance, and/or ecological health of a wetland or group of wetlands. This is often done to prioritize particular wetlands for conservation (avoidance) or to determine the degree to which loss or alteration of wetland functions should be compensated, such as by restoring degraded wetlands elsewhere or providing additional protections to existing wetlands. Rapid assessment methods are also applied before and after a wetland has been restored or altered, to help monitor or predict the effects of those actions on various wetland functions and the services they provide. Assessments are typically considered to be "rapid" when they require only a single visit to the wetland lasting less than one day, which in some cases may include interpretation of aerial imagery and GIS analyses of existing spatial data, but not detailed post-visit laboratory analyses of water or biological samples. Due to time and cost constraints, the levels of various wetland functions or other attributes are usually not measured directly but rather are estimated relative to other assessed wetlands in a region, using observation-based variables, sometimes called "indicators", that are hypothesized or known to predict performance of the specified functions or attributes. To achieve consistency among persons doing the assessment, rapid methods present indicator variables as questions or checklists on standardized data forms, and most methods standardize the scoring or rating procedure that is used to combine question responses into estimates of the levels of specified functions relative to the levels estimated in other wetlands ("calibration sites") assessed previously in a region. Rapid assessment methods, partly because they often use dozens of indicators pertaining to conditions surrounding a wetland as well as within the wetland itself, aim to provide estimates of wetland functions and services that are more accurate and repeatable than simply describing a wetland's class type. A need for wetland assessments to be rapid arises mostly when government agencies set deadlines for decisions affecting a wetland, or when the number of wetlands needing information on their functions or condition is large. In North America and a few other countries, standardized rapid assessment methods for wetlands have a long history, having been developed, calibrated, tested, and applied to varying degrees in several different regions and wetland types since the 1970s. However, few rapid assessment methods have been fully validated. Done correctly, validation is a very expensive endeavor that involves comparing rankings of a series of wetlands based on results from rapid assessment methods with rankings based on less rapid and considerably more costly, multi-visit, detailed measurements of levels of the same functions or other attributes in the same series of wetlands. Although developing a global inventory of wetlands has proven to be a large and difficult undertaking, many efforts at more local scales have been successful. Current efforts are based on available data, but both classification and spatial resolution have sometimes proven to be inadequate for regional or site-specific environmental management decision-making. It is difficult to identify small, long, and narrow wetlands within the landscape. Many of today's remote sensing satellites do not have sufficient spatial and spectral resolution to monitor wetland conditions, although multispectral IKONOS and QuickBird data may offer improved spatial resolutions once it is 4 m or higher. Majority of the pixels are just mixtures of several plant species or vegetation types and are difficult to isolate which translates into an inability to classify the vegetation that defines the wetland. Improved remote sensing information, coupled with good knowledge domain on wetlands will facilitate expanded efforts in wetland monitoring and mapping. This will also be extremely important because we expect to see major shifts in species composition due to both anthropogenic land use and natural changes in the environment caused by climate change. A wetland needs to be monitored over time to assess whether it is functioning at an ecologically sustainable level or whether it is becoming degraded. Degraded wetlands will suffer a loss in water quality, loss of sensitive species, and aberrant functioning of soil geochemical processes. Practically, many natural wetlands are difficult to monitor from the ground as they quite often are difficult to access and may require exposure to dangerous plants and animals as well as diseases borne by insects or other invertebrates..Therefore, mapping using aerial imagery is one effective tool to monitor a wetland, especially a large wetland, and can also be used to monitor the status of numerous wetlands throughout a watershed or region. Many remote sensing methods can be used to map wetlands. Remote-sensing technology permits the acquisition of timely digital data on a repetitive basis. This repeat coverage allows wetlands, as well as the adjacent land-cover and land-use types, to be monitored seasonally and/or annually. Using digital data provides a standardized data-collection procedure and an opportunity for data integration within a geographic information system. Traditionally, Landsat 5 Thematic Mapper (TM), Landsat 7 Enhanced Thematic Mapper Plus (ETM+), and the SPOT 4 and 5 satellite systems have been used for this purpose. More recently, however, multispectral IKONOS and QuickBird data, with spatial resolutions of 4 by 4 m (13 by 13 ft) and 2.44 by 2.44 m (8.0 by 8.0 ft), respectively, have been shown to be excellent sources of data when mapping and monitoring smaller wetland habitats and vegetation communities. For example, Detroit Lakes Wetland Management District assessed area wetlands in Michigan, USA, using remote sensing. Through using this technology, satellite images were taken over a large geographic area and extended period. In addition, using this technique was less costly and time-consuming compared to the older method using visual interpretation of aerial photographs. In comparison, most aerial photographs also require experienced interpreters to extract information based on structure and texture while the interpretation of remote sensing data only requires analysis of one characteristic (spectral). However, there are a number of limitations associated with this type of image acquisition. Analysis of wetlands has proved difficult because to obtain the data it is often linked to other purposes such as the analysis of land cover or land use. Methods to develop a classification system for specific biota of interest could assist with technological advances that will allow for identification at a very high accuracy rate. The issue of the cost and expertise involved in remote sensing technology is still a factor hindering further advancements in image acquisition and data processing. Future improvements in current wetland vegetation mapping could include the use of more recent and better geospatial data when it is available. Restoration and restoration ecologists intend to return wetlands to their natural trajectory by aiding directly with the natural processes of the ecosystem. These direct methods vary with respect to the degree of physical manipulation of the natural environment and each are associated with different levels of restoration. Restoration is needed after disturbance or perturbation of a wetland. Disturbances include exogenous factors such as flooding or drought. Other external damage may be anthropogenic disturbance caused by clear-cut harvesting of trees, oil and gas extraction, poorly defined infrastructure installation, over grazing of livestock, ill-considered recreational activities, alteration of wetlands including dredging, draining, and filling, and other negative human impacts. Disturbance puts different levels of stress on an environment depending on the type and duration of disturbance. There is no one way to restore a wetland and the level of restoration required will be based on the level of disturbance although, each method of restoration does require preparation and administration. There are no biophysical manipulation and the ecosystem is left to recover based on the process of succession alone. The focus of this method is to eliminate and prevent further disturbance from occurring. In order for this type of restoration to be effective and successful there must be prior research done to understand the probability that the wetland will recover with this method. Otherwise, some biophysical manipulation may be required to enhance the rate of succession to an acceptable level determined by the project managers and ecologists. This is likely to be the first method of approach for the lowest level of disturbance being that it is the least intrusive and least costly. There are some biophysical manipulations however they are non-intrusive. Example methods that are not limited to wetlands include prescribed burns to small areas, promotion of site specific soil microbiota and plant growth using nucleation planting whereby plants radiate from an initial planting site, and promotion of niche diversity or increasing the range of niches to promote use by a variety of different species. These methods can make it easier for the natural species to flourish by removing competition from their environment and can speed up the process of succession. Here there is a mix between natural regeneration and manipulated environmental control. These manipulations may require some engineering and more invasive biophysical manipulation including ripping of subsoil, agrichemical applications such as herbicides and insecticides, laying of mulch, mechanical seed dispersal, and tree planting on a large scale. In these circumstances the wetland is impaired and without human assistance it would not recover within an acceptable period of time determined by ecologists. Again these methods of restoration will have to be considered on a site by site basis as each site will require a different approach based on levels of disturbance and ecosystem dynamics. The most expensive and intrusive method of reconstruction requiring engineering and ground up reconstruction. Because there is a redesign of the entire ecosystem it is important that the natural trajectory of the ecosystem be considered and that the plant species will eventually return the ecosystem towards its natural trajectory. Constructed wetlands can take 10–100 years to fully resemble the vegetative composition of a natural wetland. Artificial wetlands do not have hydric soil. The soil has very low levels of organic carbon and total nitrogen compared to natural wetland systems, and this reduces the performance of several functions. Organic matter added to degraded natural wetlands can in some cases help restore their productivity. Other classification systems for wetlands exist. In the US, the best known are the Cowardin classification system and the hydrogeomorphic (HGM) classification system . ^ a b c d e f g h Keddy, P.A. (2010). Wetland ecology : principles and conservation (2nd ed.). New York: Cambridge University Press. ISBN 978-0521519403. ^ Butler, S., ed. (2010). Macquarie Concise Dictionary (5th ed.). Sydney, Australia: Macquarie Dictionary Publishers. ISBN 978-1-876429-85-0. ^ a b "Official page of the Ramsar Convention". Retrieved 2011-09-25. ^ "Wetlands". USDA- Natural Resource Conservation Center. ^ a b Wetland and Stream Rapid Assessments : development, validation, and application. [S.l. ]: Elsevier Academic Press. 2018. ISBN 978-0128050910. OCLC 1017607532. ^ Davidson, N.C. (2014). "How much wetland has the world lost? Long-term and recent trends in global wetland area". Marine and Freshwater Research. 65 (10): 934−941. doi:10.1071/MF14173. ^ "US EPA". 2015-09-18. Retrieved 2011-09-25. ^ a b Fraser, L.; Keddy, P.A., eds. (2005). The World's Largest Wetlands: Their Ecology and Conservation. Cambridge, UK: Cambridge University Press. ISBN 978-0521834049. ^ "WWF Pantanal Programme". Retrieved 2011-09-25. ^ Giri, C.; Pengra, B.; Zhu, Z.; Singh, A.; Tieszen, L.L. (2007). "Monitoring mangrove forest dynamics of the Sundarbans in Bangladesh and India using multi-temporal satellite data from 1973 to 2000". Estuarine, Coastal and Shelf Science. 73 (1–2): 91−100. Bibcode:2007ECSS...73...91G. doi:10.1016/j.ecss.2006.12.019. ^ Davidson, N.C.; D'Cruz, R.; Finlayson, C.M. (2005). Ecosystems and Human Well-being: Wetlands and Water Synthesis: a report of the Millennium Ecosystem Assessment (PDF). Washington, DC: World Resources Institute. ISBN 978-1-56973-597-8. Retrieved 20 March 2018. ^ "Glossary of Terms". Carpinteria Valley Water District. Archived from the original on April 25, 2012. Retrieved 2012-05-23. ^ "Glossary". Mapping2.orr.noaa.gov. Archived from the original on 2012-04-25. Retrieved 2012-05-23. ^ "Glossary". Alabama Power. Archived from the original on 2012-03-21. Retrieved 2012-05-23. ^ a b c d Mitsch, William J.; Gosselink, James G. (2007-08-24). Wetlands (4th ed.). New York, NY: John Wiley & Sons. ISBN 978-0-471-69967-5. ^ Keddy (2010), p. 2. ^ "The Ramsar 40th Anniversary Message for November". Ramsar. Retrieved 2011-10-10. ^ "EPA Regulations listed at 40 CFR 230.3(t)". US Environmental Protection Agency. March 2015. Retrieved 2014-02-18. ^ US Government Publishing Office. (2011) 16 U.S. Code Chapter 58 Subchapter I, § 3801 – Definitions. Legal Information Institute, Cornell Law School, Ithaca. ^ Richardson, J. L.; Arndt, J. L.; Montgomery, J. A. (2001). "Hydrology of wetland and related soils". In Richardson, J. L.; Vepraskas, M. J. (eds.). Wetland Soils. Boca Raton, FL: Lewis Publishers. ^ Vitt, D. H.; Chee, W (1990). "The relationships of vegetation to surface water chemistry and peat chemistry in fens of Alberta, Canada". Plant Ecology. 89 (2): 87–106. doi:10.1007/bf00032163. ^ Silliman, B. R.; Grosholz, E. D.; Bertness, M. D., eds. (2009). Human Impacts on Salt Marshes: A Global Perspective. Berkeley, CA: University of California Press. ^ Smith, M. J.; Schreiber, E. S. G.; Kohout, M.; Ough, K.; Lennie, R.; Turnbull, D.; Jin, C.; Clancy, T. (2007). "Wetlands as landscape units: spatial patterns in salinity and water chemistry". Wetlands, Ecology & Management. 15 (2): 95–103. doi:10.1007/s11273-006-9015-5. ^ Ponnamperuma, F. N. (1972). The chemistry of submerged soils. Advances in Agronomy. 24. pp. 29–96. doi:10.1016/S0065-2113(08)60633-1. ISBN 9780120007240. ^ Moore, P. A., Jr.; Reddy, K. R. (1994). "Role of Eh and pH on phosphorus geochemistry in sediments of Lake Okeechobee, Florida". Journal of Environmental Quality. 23 (5): 955–964. doi:10.2134/jeq1994.00472425002300050016x. ^ Minh, L. Q.; Tuong, T. P.; van Mensvoort, M. E. F.; Bouma, J. (1998). "Soil and water table management effects on aluminum dynamics in an acid sulphate soil in Vietnam". Agriculture, Ecosystems & Environment. 68 (3): 255–262. doi:10.1016/s0167-8809(97)00158-8. ^ Schlesinger, W. A. (1997). Biogeochemistry: An Analysis of Global Change (2nd ed.). San Diego, CA: Academic Press. ^ Bedford, B. L. (1996). "The need to define hydrologic equivalence at the landscape scale for freshwater wetland mitigation". Ecological Applications. 6 (1): 57–68. doi:10.2307/2269552. JSTOR 2269552. ^ Nelson, M. L.; Rhoades, C. C.; Dwire, K. A. (2011). "Influences of Bedrock Geology on Water Chemistry of Slope Wetlands and Headwaters Streams in the Southern Rocky Mountains". Wetlands. 31 (2): 251–261. doi:10.1007/s13157-011-0157-8. ^ "Blacktown Council wetlands". Archived from the original on 2011-04-10. Retrieved 2011-09-25. ^ Hutchinson, G. E. (1975). A Treatise on Limnology. Vol. 3: Limnological Botany. New York, NY: John Wiley. ^ Hughes, F. M. R., ed. (2003). The Flooded Forest: Guidance for policy makers and river managers in Europe on the restoration of floodplain forests. FLOBAR2, Department of Geography, University of Cambridge, Cambridge, UK. ^ Wilcox, D. A; Thompson, T. A.; Booth, R. K.; Nicholas, J. R. (2007). Lake-level variability and water availability in the Great Lakes. USGS Circular 1311. ^ Goulding, M. (1980). The Fishes and the Forest: Explorations in Amazonian Natural History. Berkeley, CA: University of California Press. ^ a b c d e f "Ramsar Convention Ecosystem Services Benefit Factsheets". Retrieved 2011-09-25. ^ "Frogs | Bioindicators". Savethefrogs.com. 2011. Retrieved 2014-01-21. ^ Mazzotti, F.J.; Best, G.R. ; Brandt, L.A.; Cherkiss, M.S. ; Jeffery, B.M. ; Rice, K.G. (2009). "Alligators and crocodiles as indicators for restoration of Everglades ecosystems". Ecological Indicators. 9 (6): S137−S149. doi:10.1016/j.ecolind.2008.06.008. ^ Messel, H. 1981. Surveys of tidal river systems in the Northern Territory of Australia and their crocodile populations (Vol. 1). Pergamon Press. ^ Milton, W. (1999). Wetland birds: habitat resources and conservation implications. Cambridge: Cambridge University Press. ISBN 978-0511011368. OCLC 50984660. ^ "Taken from Blacktown Council Wetland Inventory". Blacktown Council. Archived from the original on 2012-01-22. Retrieved 2012-05-23. ^ "PEATLANDS, CLIMATE CHANGE MITIGATION AND BIODIVERSITY CONSERVATION". ^ "Ramsar Convention Technical Reports". ^ Adamus, P.R. and L.T. Stockwell. 1983. A Method for Wetland Functional Assessment. Vol. I. Critical Review and Evaluation Concepts. FHWA-IP-82-23. Federal Highway Admin., Washington, DC. ^ "United Nations Environment Programme (UNEP) – Home page". Retrieved 2011-12-11. ^ Murray, N. J.; Clemens, R. S.; Phinn, S. R.; Possingham, H. P.; Fuller, R. A. (2014). "Tracking the rapid loss of tidal wetlands in the Yellow Sea" (PDF). Frontiers in Ecology and the Environment. 12 (5): 267–272. doi:10.1890/130260. ^ "FAO". Archived from the original on 2007-09-09. Retrieved 2011-09-25. ^ "Letting Nature Do the Job". Wild.org. 2008-08-01. Archived from the original on 2013-01-13. Retrieved 2012-05-23. ^ Valiela, I.; Collins, G.; Kremer, J.; Lajtha, K.; Geist, M.; Seely, B.; Brawley, J.; Sham, C. H. (1997). "Nitrogen loading from coastal watersheds to receiving estuaries: New method and application". Ecological Applications. 7 (2): 358–380. doi:10.2307/2269505. JSTOR 2269505. ^ Nixon, S. W. (1986). "Nutrients and the productivity of estuarine and coastal marine ecosystems". Journal of the Limnological Society of South Africa. 12 (1–2): 43–71. doi:10.1080/03779688.1986.9639398. ^ Galloway, J. (2003). "The Nitrogen Cascade". BioScience. 53 (4): 341–356. Bibcode:1985BioSc..35..499W. doi:10.1641/0006-3568(2003)053[0341:tnc]2.0.co;2. ^ Diaz, R. J.; Rosenberg, R. (2008). "Spreading Dead Zones and Consequences for Marine Ecosystems". Science. 321 (5891): 926–929. Bibcode:2008Sci...321..926D. doi:10.1126/science.1156401. PMID 18703733. ^ Brix, H (1993). "Wastewater treatment in constructed wetlands: system design, removal processes, and treatment performance". In Moshiri, A. G. (ed.). Constructed Wetlands for Water Quality Improvement. Boca Raton, FL: CRC Press. ^ Hoffmann, H.; Platzer, C.; von Münch, E.; Winker, M. (2011). "Technology review of constructed wetlands – Subsurface flow constructed wetlands for greywater and domestic wastewater treatment" (PDF). Eschborn, Germany: Deutsche Gesellschaft für Internationale Zusammenarbeit. ^ Timoshkin, O. A., ed. (2004). Index of animal species inhabiting Lake Baikal and its catchment area. Guides and Keys to Identification of Fauna and Flora of Lake Baikal. 2. 1 (1st ed.). Novosibirsk, Nauka: John Wiley & Sons. ISBN 978-5-02-031736-9. ^ Johnson, W. C.; Millett, B. V.; Gilmanov, T.; Voldseth, R. A.; Guntenspergen, G. R.; Naugle, D. E. (2005). "Vulnerability of Northern Prairie Wetlands to Climate Change". Bio Science. 10: 863–872. ^ Maltby, Edward (1986). Waterlogged wealth: why waste the world's wet places?. Earthscan. London: International Institute for Environment and Development. ISBN 978-0905347639. OCLC 18834448. ^ a b c "The Ramsar Information Sheet on Wetlands of International Importance". September 18, 2009. Retrieved November 19, 2011. ^ Synthesis of Adaptation Options for Coastal Areas. Climate Ready Estuaries Program, EPA 430-F-08-024. Washington, DC: US Environmental Protection Agency. 2009. ^ Roulet, N. T. (2000). "Peatlands, Carbon Storage, Greenhouse Gases, And The Kyoto Protocol: Prospects And Significance For Canada". Wetlands. 20 (4): 605–615. doi:10.1672/0277-5212(2000)020[0605:pcsgga]2.0.co;2. ^ "More on blue carbon and carbon sequestration". ^ a b Bange, H. W. (2006). "Nitrous oxide and methane in European coastal waters". Estuarine, Coastal and Shelf Science. 70 (3): 361–374. Bibcode:2006ECSS...70..361B. doi:10.1016/j.ecss.2006.05.042. ^ Thompson, A. J.; Giannopoulos, G.; Pretty, J.; Baggs, E. M.; Richardson, D. J. (2012). "Biological sources and sinks of nitrous oxide and strategies to mitigate emissions". Philosophical Transactions of the Royal Society B. 367 (1593): 1157–1168. doi:10.1098/rstb.2011.0415. PMC 3306631. PMID 22451101. ^ Ravishankara, A. R.; Daniel, John S.; Portmann, Robert W. (2009). "Nitrous Oxide (N2O): The Dominant Ozone-Depleting Substance Emitted in the 21st Century". Science. 326 (5949): 123–125. Bibcode:2009Sci...326..123R. doi:10.1126/science.1176985. PMID 19713491. ^ a b Moseman-Valtierra, S.; et al. (2011). "Short-term nitrogen additions can shift a coastal wetland from a sink to a source of N2O". Atmospheric Environment. 45 (26): 4390–4397. Bibcode:2011AtmEn..45.4390M. doi:10.1016/j.atmosenv.2011.05.046. ^ Martin, Rose M.; Wigand, Cathleen; Elmstrom, Elizabeth; Lloret, Javier; Valiela, Ivan (20 April 2018). "Long-term nutrient addition increases respiration and nitrous oxide emissions in a New England salt marsh". Ecology and Evolution. 8 (10): 4958–4966. doi:10.1002/ece3.3955. ISSN 2045-7758. PMC 5980632. PMID 29876073. ^ Moseman-Valtierra, S. (2012). "Chapter 1: Reconsidering the climatic roles of marshes: Are they sinks or sources of greenhouse gases?". In Abreu, D. C.; Borbón, S. L. (eds.). Marshes: Ecology, Management and Conservation. New York, NY: Nova Science. ^ a b Chen, G.; Tam, N.; Ye, Y. (2010). "Summer fluxes of atmospheric greenhouse gases N2O, CH4 and CO2 from mangrove soil in South China". Science of the Total Environment. 408 (13): 2761–2767. Bibcode:2010ScTEn.408.2761C. doi:10.1016/j.scitotenv.2010.03.007. PMID 20381125. ^ Krithika, K.; Purvaja, R.; Ramesh, R. (2008). "Fluxes of methane and nitrous oxide from an Indian mangrove". Current Science. 94: 218–224. ^ a b Chauhan, R.; Ramanathan, A. L.; Adhya, T. K. (2008). "Assessment of methane and nitrous oxide flux from mangroves along Eastern coast of India". Geofluids. 8 (4): 321–332. doi:10.1111/j.1468-8123.2008.00227.x. ^ Kreuzwieser, J.; Buchholz, J.; Rennenberg, H. (2003). "Emission of methane and nitrous oxide by Australian mangrove ecosystems". Plant Biology. 5 (4): 423–431. doi:10.1055/s-2003-42712. ^ Allen, D. E.; Dalal, R. C.; Rennenberg, L.; Meyer, R.; Reeves, S.; Schmidt, S. (2007). "Spatial and temporal variation of nitrous oxide and methane flux between subtropical mangrove soils and the atmosphere". Soil Biology and Biochemistry. 39 (2): 622–631. doi:10.1016/j.soilbio.2006.09.013. ^ a b Sotomayor, D.; Corredor, J. E.; Morell, J. M. (1994). "Methane flux from mangrove soils along the southwestern coast of Puerto Rico". Estuaries. 17 (1): 140–147. doi:10.2307/1352563. JSTOR 1352563. ^ Jordan, T. E.; Andrews, M. P.; Szuch, R. P.; Whigham, D. F.; Weller, D. E.; Jacobs, A. D. (2007). "Comparing Functional Assessments Of Wetlands To Measurements Of Soil Characteristics And Nitrogen Processing" (PDF). Wetlands (Submitted manuscript). 27 (3): 479–497. doi:10.1672/0277-5212(2007)27[479:cfaowt]2.0.co;2. ^ Weller, D. E.; Cornell, D. L.; Jordan, T. E. (1994). "Denitrification in riparian forests receiving agricultural discharges". Global Wetlands: Old World and New: 117–131. ^ Yu, J.; Liu, J.; Wang, J.; Sun, W.; Patrick, W. H.; Meixner, F. X. (2007). "Nitrous Oxide Emission from Deyeuxia angustifolia Freshwater Marsh in Northeast China". Environmental Management. 40 (4): 613–622. Bibcode:2007EnMan..40..613Y. doi:10.1007/s00267-006-0349-9. PMID 17661130. ^ Roobroeck, D.; Butterbach-Bahl, K.; Brüggemann, N.; Boeckx, P. (2010). "Dinitrogen and nitrous oxide exchanges from an undrained monolith fen: Short-term responses following nitrate addition". European Journal of Soil Science. 61 (5): 662–670. doi:10.1111/j.1365-2389.2010.01269.x. ^ Hefting, M. M.; Bobbink, R.; De Caluwe, H. (2003). "Nitrous Oxide Emission and Denitrification in Chronically Nitrate-Loaded Riparian Buffer Zones". Journal of Environment Quality. 32 (4): 1194. doi:10.2134/jeq2003.1194. ^ Liikanen, A. (2009). "Methane and nitrous oxide fluxes in two coastal wetlands in the northeastern Gulf of Bothnia, Baltic Sea". Boreal Environment Research. 14 (3): 351–368. ^ Moseman-Valtierra, S.; et al. (2011). "Short-term nitrogen additions can shift a coastal wetland from a sink to a source of N2O". Atmospheric Environment. 45 (26): 4390–4397. Bibcode:2011AtmEn..45.4390M. doi:10.1016/j.atmosenv.2011.05.046. ^ Stief, P.; Poulsen, M.; Nielsen; et al. (2009). "Nitrous oxide emission by aquatic macrofauna". Proceedings of the National Academy of Sciences. 106 (11): 4296–4300. Bibcode:2009PNAS..106.4296S. doi:10.1073/pnas.0808228106. PMC 2651200. PMID 19255427. ^ a b "Wetlands International works to sustain and restore wetlands for people and biodiversity". Wetlands International. Retrieved 2014-01-21. ^ Office of Research & Development. "Impacts on quality of inland wetlands of the United States: A survey of indicators, techniques, and applications of community-level biomonitoring data". cfpub.epa.gov. Retrieved 2018-07-27. ^ Adamus, Paul; J. Danielson, Thomas; Gonyaw, Alex (2001-03-24). Indicators for Monitoring Biological Integrity of Inland Freshwater Wetlands: A Survey of North American Technical Literature (1990-2000). 13214. doi:10.13140/rg.2.2.22371.86566. ^ a b c d e f g h i j k l m n o p q r s t u v w x y Clewell, AF; Aronson, J (2013). Ecological restoration (2nd ed.). Washington, DC: Island Press. ^ Finlay, Jacques C.; Efi Foufoula-Georgiou; Dolph, Christine L.; Hansen, Amy T. (February 2018). "Contribution of wetlands to nitrate removal at the watershed scale". Nature Geoscience. 11 (2): 127–132. Bibcode:2018NatGe..11..127H. doi:10.1038/s41561-017-0056-6. ISSN 1752-0908. ^ Hansen, Amy T.; Dolph, Christine L.; Foufoula-Georgiou, Efi; Finlay, Jacques C. (2018-01-29). "Contribution of wetlands to nitrate removal at the watershed scale". Nature Geoscience. 11 (2): 127–132. Bibcode:2018NatGe..11..127H. doi:10.1038/s41561-017-0056-6. ISSN 1752-0894. ^ Kelman Wieder, R.; Lang, GeraldE. (November 1984). "Influence of wetlands and coal mining on stream water chemistry". Water, Air, and Soil Pollution. 23 (4): 381. Bibcode:1984WASP...23..381K. doi:10.1007/bf00284734. ISSN 0049-6979. ^ Jones, C Nathan; McLaughlin, Daniel L; Henson, Kevin; Haas, Carola A; Kaplan, David A (2018-01-10). "From salamanders to greenhouse gases: does upland management affect wetland functions?". Frontiers in Ecology and the Environment. 16 (1): 14–19. doi:10.1002/fee.1744. ISSN 1540-9295. ^ Van de Ven, G. P. (2004). Man-Made Lowlands: History of water management and land reclamation in the Netherlands. Utrecht: Uitgeverij Matrijs. ^ Wells, Samuel A. (1830). A History of the Drainage of the Great Level of the Fens called Bedford Level 2. London: R. Pheney. ^ Dahl, Thomas E.; Allord, Gregory J. "History of Wetlands in the Conterminous United States". ^ Lander, Brian (2014). "State Management of River Dikes in Early China: New Sources on the Environmental History of the Central Yangzi Region". T'oung Pao. 100 (4–5): 325–362. doi:10.1163/15685322-10045p02. ^ "unknown title". New Scientist (1894). 1993-10-09. p. 46. ^ "Good practices and lessons learned in integrating ecosystem conservation and poverty reduction objectives in wetlands" (PDF). The Ramsar Convention on Wetlands. 2008-12-01. Retrieved 2011-11-19. ^ Adamus, P. (2016). "Manual for the Wetland Ecosystem Services Protocol (WESP)" (PDF). Oregon State University. Retrieved July 28, 2018. ^ Dorney, J.; Savage, R.; Tiner, R.W. ; Adamus, P., eds. (2018). Wetland and Stream Rapid Assessments: Development, Validation, and Application. Cambridge: Academic Press. ISBN 978-0-12-805091-0. ^ Corbin, JD; Holl, KD (2012). "Applied nucleation as a forest restoration strategy". Forest Ecology and Management. 256: 37–46. doi:10.1016/j.foreco.2011.10.013. ^ Hart, T. M.; Davis, S. E. (2011). "Wetland development in a previously mined landscape of East Texas, USA". Wetlands Ecological Management. 19 (4): 317–329. doi:10.1007/s11273-011-9218-2. ^ a b Rubec, Clayton DA; Hanson, Alan R (2009). "Wetland mitigation and compensation: Canadian experience". Wetlands Ecol Manage. 17: 3–14. doi:10.1007/s11273-008-9078-6. ^ "A Directory of Important Wetlands in Australia". Australian Department of the Environment. 2009-07-27. Retrieved 2012-05-23. ^ "NPWRC :: Classification of Wetlands and Deepwater Habitats of the United States". www.fws.gov. Retrieved 2018-07-28. Wikimedia Commons has media related to Wetlands. Dorney, J.; R. Savage, P. Adamus, and R. Tiner, eds. (2018). Wetland and Stream Rapid Assessments: Development, Validation, and Application. Elsevier Science Publishers. ISBN 9780128050910. Mitsch, W. J.; J. G., Gosselink (2007). Wetlands (4th ed.). Hoboken, NJ: John Wiley & Sons. Brinson, M. (1993). A Hydrogeomorphic Classification of Wetlands. "1987 U.S. Army Corps of Engineers Wetland delineation manual" (PDF). Dugan, Patrick, ed. (1993). Wetlands in Danger. World Conservation Atlas Series. Terra Nuova East Africa. Wetlands in drylands. Fredrikson, Leigh H. (1983). Wetlands: A Vanishing Resource. Yearbook of Agriculture. Fraser, L. H.; P. A., Keddy, eds. (2005). The World's Largest Wetlands: Ecology and Conservation. Cambridge, UK: Cambridge University Press. ISBN 9780521834049. Ghabo, A. A. (2007). Wetlands Characterization: Use by Local Communities and Role in Supporting Biodiversity in the Semiarid Ijara District, Kenya. Keddy, P. A. (2010). Wetland Ecology: Principles and Conservation (2nd ed.). Cambridge, UK: Cambridge University Press. MacKenzie, W. H.; Moran, J. R. (2004). Wetlands of British Columbia: A Guide to Identification (PDF). Land Management Handbook 52. Ministry of Forests. Maltby, E.; Barker, T., eds. (2009). The Wetlands Handbook. Oxford: Wiley-Blackwell. Mitsch, W. J.; Gosselink, J. G.; Anderson, C. J.; Zhang, L. (2009). Wetland Ecosystems. Hoboken, NJ: John Wiley & Sons. ISBN 978-0470286302. Romanowski, N (2013). Living Waters. Melbourne, VIC: CSIRO Publishing. ISBN 9780643107564.